Can you identify any of the people in this picture? Black and white negative showing the factory of the William J. Anderson Company. A number of women are seated at tables constructing jewellery boxes. 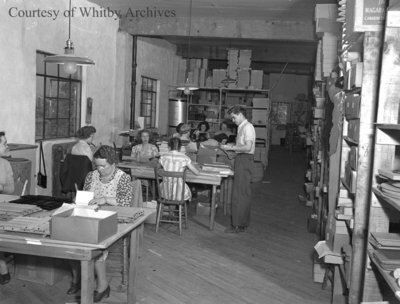 The William J. Anderson Company moved from Toronto to Whitby in 1946 and began operations in 1947. The factory mainly produced jewellery boxes. George Anderson, son of William J. Anderson, sold the company in 1976 and by 1979 the factory was closed. Ruddy, Marjorie ; Anderson, William J.
William J. Anderson Company, October 17, 1947, Marjorie Ruddy. Whitby Archives A2013_040_450.